Losing a password is one thing, but no body can blame you if you lose a product key. No one can remember such a long string of random letters and numbers and it's quite easy to misplace a piece of paper or a file. Fortunately, product keys are easier to recover, especially if you have the right tool. A good example is MyKeyFinder, which is capable of retrieving any keys directly from your system's Registry. It can show you the product key of your operating system, as well as any other piece of software you have on your computer. The utility can be used on Windows 7 or any later edition, up to Windows 10. It comes in a small package and it can be installed quickly and effortlessly. You don't need to have any special drivers or services installed and you won't notice a significant impact on your computer's performance. When launched, the application will immediately start to scan your Registry for product keys. The keys are displayed in a list as they are found. Search results include software names, as well as the actual product keys. If you are looking for the key of a specific product, you can type its name in a search box to locate it instantly. What's more, you can add products to the list manually, select individual entries and print them or export the information to a PDF file. The software is not limited to scanning the Registry. It is also capable of scanning for your Wi-Fi password. Another useful feature, that is definitely worth mentioning, is the possibility of scanning external drives. If you have a Windows installation USB drive, you can scan it and retrieve the product key. MyKeyFinder has a modern user interface and controls that are highly intuitive and easy to spot. You won't have to spend a second more than you have to when scanning for product keys. Everything can be done quickly, with nothing more than a few clicks. 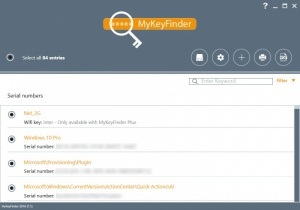 Lost product keys are no longer a concern, thanks to MyKeyFinder's efficient functionality. You can recover product keys and your Wi-Fi password in just a few seconds. The application can also scan external Windows installation drives. The found information can be printed or saved as a PDF file. Certain operations can be performed only in the paid version. You can download MyKeyFinder free here.